The New Mexico Attorney General's Office is overseen by the Attorney General of New Mexico, an elected executive officer of the state. The AG serves as head of the New Mexico Department of Justice and is required to be a licensed attorney. In New Mexico the AG is fifth in succession to the office of governor, after the lieutenant governor, secretary of state, President pro tempore of the New Mexico Senate, and the Speaker of New Mexico House of Representatives. The AG functions as the state's chief legal officer, legal counsel to state government, consumer advocate, and guardian of the public interest. The AG represents the state before any courts or agencies when the public interest requires or when requested by the Governor and prosecutes and defends all causes in the New Mexico Supreme Court, New Mexico Court of Appeals, or any other court or tribunal in which the state is a party or is interested. The AG prosecutes and defends all actions and proceedings involving any state employee in his/her official capacity. Also, the AG may represent residential or small business consumers before the New Mexico Public Regulation Commission. Upon request, the AG will provide written legal opinions to the legislature, any state official, or any district attorney on any subject pending before one of these officials. 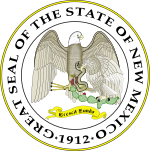 In matters involving the state Election Code the AG provides legal assistance to the Secretary of State of New Mexico. The AG drafts contracts, bonds, and other instruments as required for use by the state. At the governor's direction, the AG may attend and assist in the trial of any indictment or information in any county of the state. When a District Attorney fails or refuses to act, the AG may act on behalf of a county in any criminal or civil case. In matters of the impeachment of a state legislator or employee, the AG initiates conflict of interest enforcement actions. The AG also prosecutes removal proceedings against district attorneys. The AG establishes and maintains a register of all documents filed by charitable organizations and makes it available for public inspection. ^ Since the first state election was in an odd-numbered year (1911), the term lasted five years. ^ Appointed by Governor Dempsey in 1944. ^ Appointed by Governor Burroughs in 1959. ^ State of New Mexico (July 2012). Kathryn A. Flynn, ed. 2012 Centennial Blue Book (PDF). Diana J. Duran. Office of the New Mexico Secretary of State. pp. 227–229. This page was last edited on 21 August 2018, at 02:18 (UTC).